At the end of December, our family moved across the country from Los Angeles to Nashville. Before we left, I styled and photographed a few areas of the Topanga Canyon home I designed. The whole house went through such a transformation with gorgeous new flooring, and bright white paint. It helps that the clients are the owners of a high-end flooring company, so they know their stuff! We chose a wide plank and a very natural finish. It's so beautiful in person. Here's the tour, with before and after photos at the end. In the kitchen we removed a cast iron wood burning stove and added a bar. The cabinets are all new and painted Farrow and Ball's Pavilion Gray. The marble is Calacatta, and we used lighting and hardware from Schoolhouse Electric. Brass schluter adds a pop of shine and completes the edges of the backsplash. The open shelves are walnut, and the rug is vintage. On the refrigerator side, we took the cabinets all the way up to the ceiling and added crown molding for a finished look. In the living room, the original rock wall was overpowering and heavy. Out it went, and the whole living area felt so much better. To add just a touch of modern farmhouse, I showed them inspiration for a shiplap fireplace wall. The walnut mantle ties into the kitchen's open shelving, and the black Schoolhouse Electric sconces look so great with the petite granite stone on the fireplace and bench. I wish I had a closeup of it--it looks like there are little fossils in the stone, so cool. The fossils and variations in color help the black not feel too heavy and dark. Due to the shape of the room (which is hard to see here), there was nowhere for a TV to go besides above the fireplace. We discussed various ways in which to hide it but ultimately ended up with the TV visible. The fireplace itself is off center on the wall, but we knew the furniture arrangement would be centered; therefore we decided to center the TV on the wall instead of directly above the fireplace. We reconfigured the master bath to fit both sinks on one side of the room. Previously the bathroom had been split up, with a vanity on either side of the room. The tub felt like it was in a cave, with all the tan tile and rock surrounding it. We added an additional skylight so that it would never feel like a cave again! 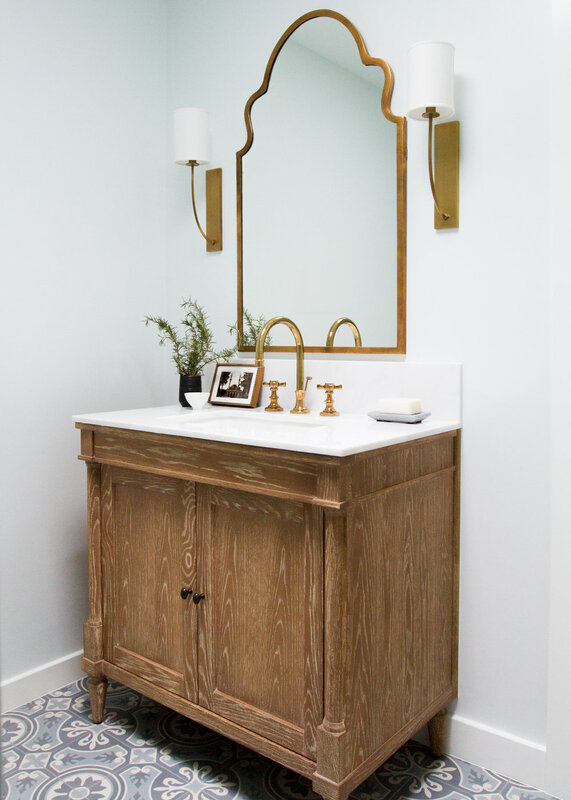 This bathroom has a romantic feel, with the brass accents, marble backsplash, and the lucite and gold pulls from Restoration Hardware. The shower is done in a white herringbone pattern. The design inspiration for the hall bath came from the cement tiles we found at Cement Tile Shop. I had always wanted to use this Wisteria mirror, and I chose the vanity and sconces to work with it. Here are the before and afters from the project.